Shredding – What should you shred? Shred documents that you would not want a stranger with bad intentions to have, even junk mail addressed to you, like those credit offers. You should shred anything that has personal information like your name, address, phone number, social security number, or bank account information. This might include shredding a few documents you don’t initially think about, including ATM receipts, credit card receipts, bills, and even used airline tickets. Here are some more items you should shred: Address labels from junk mail and magazines, ATM receipts, , bank statements, bids, Birth certificate copies, blueprints, brokerage reports, Voided checks, cancelled checks, classified information, client information, client lists, confidential letters, contracts, correspondence, Credit and charge card bills, carbon copies, summaries and receipts, credit applications, credit card statements, Credit reports and histories, Documents containing maiden name (used by credit card companies for security reasons), Documents containing names, addresses, phone numbers or e-mail addresses, Documents containing passwords or PIN numbers, Documents relating to investments, Driver’s licenses or items with a driver’s license number, Employee pay stubs, employment information, Employment records, Expired passports and visas, financial reports, human resource files, insurance policies, Investment, stock and property transactions, invoices, Items with a signature (leases, contracts, letters), job applications, Legal documents, legal documents, Luggage tags, Medical and dental records, medical records, memos, Papers with a Social Security number, patient data, payroll records, personalized junk mail, Pre-approved credit card applications, quotes, receipts, Receipts with checking account numbers, Report cards, Resumés or curriculum vitae, signatures, student records, Tax forms, tax records, Transcripts, Travel itineraries, identification cards (college IDs, state IDs, employee ID badges, military IDs), Used airline tickets, Utility bills (telephone, gas, electric, water, cable TV, Internet). Clearly, this is not everything that should be shredded, but it certainly should give you a better understanding of what items that are shredding must and how to protect yourself from identity theft. How long should you save personal records? Many people store records for much longer than necessary. Many of us seem fond of stashing reams of paper records in storage boxes, even though there’s little reason to keep such paper for decades. Tax time is a good time to consider how you save your tax returns and other financial documents. Federal tax returns and supporting documentation, like W-2 forms (and utility bills, if they support a home-office deduction), should be kept for a minimum of three years. That’s because the Internal Revenue Service can generally audit tax returns for up to three years after the tax filing deadline. But the agency can go back six years, if you under-reported your income by more than 25 percent. (And there’s no time limit on an audit for filing a fraudulent return.) Many accountants advise keeping returns and supporting documents for at least seven years. Shredding company advise, do what your CPA says to do. Shred Bull shredding tip – We are a shredder, ask an attorney or CPA if you don’t know what to save. Are there some records that should never be shredded? Documents, like birth certificates, Social Security cards, wills, life insurance policies and divorce decrees, should be kept in a safe place, like a fireproof box or a bank safe deposit box, indefinitely. In summary when you do dispose of paper financial documents, you should shred them rather than simply dumping them intact in the trash or recycling bin. This alone will reduce the risk of identity theft. Anything with personal information, like your date of birth, Social Security number or account numbers must get shredded. The best way to shred small amounts of paper is a “cross cut” shredder. If you have more than a bag or box to shred, just bring it by Shred Bull’s Rancho Santa Margarita office on Saturday mornings. 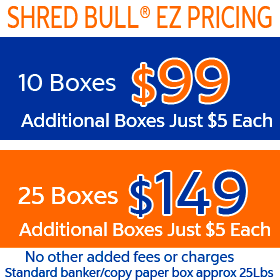 We can shred a dozen boxes in about 5 minutes, so it is not only convenient, it is a huge time saver. We hope you enjoyed this shredding tip article. Bottom line, ask your tax or legal people if you want to be sure of what you need to keep, and go to Shred Bull when you need to shred!